How to push mobs into water elevators? Pretty simple and straight forward. I have my dark rooms facility for hostile mobs spawning built for some time already. Even though it has some conceptual flaws, it's just fine. And I still play on 1.12.2, because of forge. However, when the Sun turns into red gigant, there is expected release of forge for 1.13. And in that version, I intend to use water elevator. Currently, all mobs just swim to the top. 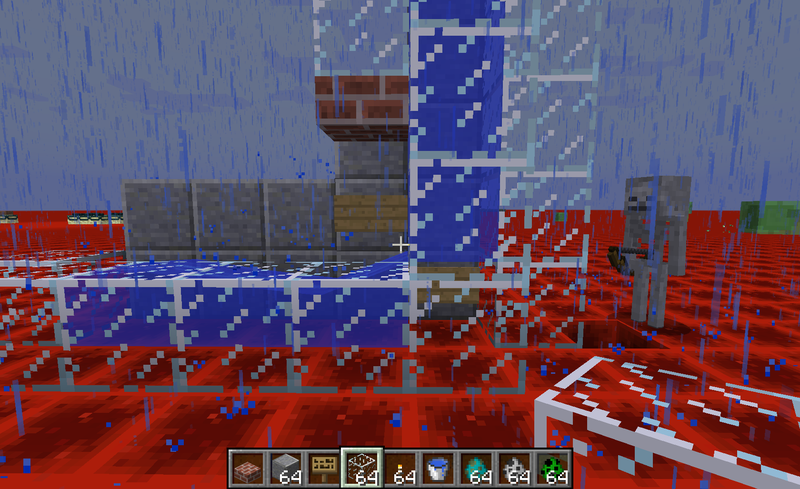 And I can get to column of water from flowing water reasonably easy. But I still don't know, how to get them into water elevator from flowing water. There will always be 1 block, where is no water pushing on them, because I need those signs blocking water from elevator. Mobs are spawning in dark rooms, then using their movement and the fact how they treat open trap doors, they're collected into streams in those rooms. Those brings them to central fall space, they just fall down through holes in other level floors, down to collection stream from the entire building section. 2 sections are then combined and go to their elevator. Mobs are pushed up, about 30 m, then in another stream pushed inwards and that stream ends where is the final falling hole, which gives them just the right amount of fall damage I can just finish them off by single/couple punches. All of this is set and build. I cannot rebuild some parts, because this building is not alone in it's space and it would be beyond painful to do that. I will also not move collection room to some y=10, or something like that. It needs to be easily accessible, since I cannot build elevators for me, again, there is no room. So, I need just a simple thing. How to get mobs from flowing water, uninterrupted, to (bottom of) water elevator. Anyone any ideas? Place a sign at the bottom of the water elevator and a sign above the water stream just outside the elevator. This won't work for baby zombies since they are too short to reach the start of the elevator. And if you do upgrade to 1.13 it will break water elevators, mobs will no longer float up, you'll need to look into the new water column mechanics using soul sand and magma blocks. Wait…no, I know this, but I'm specifically asking for 1.13. With the new water elevators. That's what I need. I know the old water mechanics well. But the new one…well…I know it, but I don't know, how to achieve what I need. Wait…no, I know this, but I'm specifically asking for 1.13. I guess it was the bit about the sun turning into a red giant that made me think you were sticking with 1.12 for the foreseeable future. I knew how the elevators themselves work in 1.13 but I had no idea how to push the mobs in but I found this video where they are pushed in diagonally with fences holding the water in place. I don't know how well you know the mechanics in 1.13 so just ignore the following if it's already clear to you. To get the elevators to work you need an unbroken column of water source blocks, you can turn flowing water into source blocks by planting kelp and either letting it grow or continue placing new kelp on top of the old until you reach the top, if you let it grow on it's own you may need to break the top piece every once and a while or it will eventually stop growing. Kelp can be placed on most blocks but not on soul sand, so you'd need to place the soul sand after using the kelp. Soul sand at the bottom of the water makes the elevator go up, magma blocks make it go down, but damages mobs and you, unless you crouch. Then there's the waterlogging mechanism, most non full blocks can be waterlogged, have a water source block in the same block, I think doors are the only exception. Placing a fence, for instance, in a water source block won't remove the water, you need to remove the source block first, then place the fence. Clicking on the fence with a water bucket will waterlog the fence as will having source blocks on two sides of the fence. Corners! Yeah, that's good idea, I think I could get it there to work. Awesome. I just don't get one thing, which has nothing to do with the mechanics itself, but the choices. Magma block implies heat. If you put water on it, it would like…heat it up and stuff. So, it should create upwards bubbles. While soul sand, if you walk on it, drags you down a bit and slows you down. So it should create downwards bubbles. They did it exactly opposite than it's logical. I still don't understand their choices. Liquids have a hard limit to the degree they can compress in a given container at a given air pressure. This is the entire basis behind the concept of hydraulics. Gasses, however, do not have this limit and can collapse indefinitely so long as the container remains viable (if the container breaks, the higher pressure inside moves to the lower pressure outside). From a logical standpoint, where Mojang got it "wrong" was in using soul sand as an upward movement. However, since there's no counterpart to it in the real world there's no argument logically-speaking and so we have to find explanation and meaning elsewhere. In this case, presumably, a bunch of souls are swirling around to agitate the water to create bubbles but instead of sinking through the bubbles they're tugging on you in some way and dragging you upwards (alternatively, you could assume they're churning the water so much that the sheer force of the current is carrying you along with it, not unlike getting blown away by a strong gust of wind in a hurricane or tornado). MS/Mj 'logic' in this regard seems to have flowed from the wish to have 'down-streams' as part of underwater ravines (and an unwillingness to change the longstanding water/lava interaction), thus mandating magma blocks, while 'up-streams' were casued by some other block (with the choices apparently limited to those not found in the overworld). may also be of use (although some of the replies suggest MS/Mj 'fixed' this). Had the same problem and never got a satisfactory solution so in the end I just put an ice block there and left the mobs to push each other in. Generally it means there is one hanging around most of the time but it doesn't seem to affect spawn rates on my hostile mob / record / charged creeper farm. I am currently hanging around in my afk spot 120 blocks above the farm waiting with 15 creepers for a thunder storm. DuhDerp: Yes, of course. Like…I kind of know, but didn't care much as I was writing that. ScotsMiser: Yes, I understand that. And I get the basis of that decision. I'm just saying I'd do it the other way around. I've tried the corner one and it seems like they get stuck, so I suppose signs all the way, with ice, that is possible. I was also thinking about some pistons, as the guy said, but never got to test it. Maybe try it though. Max_Greece: Yeah, that is pretty much the simplest solution, which…sort of works, but not really. We need something, what works consistently, 100% of the time. Heh. For my entire time playing MC, I have NEVER encountered charged creeper. Prior to 1.13 I had only ever seen one charged creeper and that was in the first few weeks of playing minecraft. I had no idea at the time how rare they were. Now I make them for fun with the enchanted trident (channeling enchantment I think). Just have to be patient waiting for a thunderstorm. I'm thinking of setting up a wither head harvesting station as blowing them up with a charged creeper guarantees a head drop. TangoTek has set one up on this season of Hermitcraft - I'll probably do a similar design if I can find a handy nether fortress. Max_Greece: Yeah, they're super rare. And to be honest, I don't mind I haven't seen one yet. I don't particularly care. That's novelty, besides functional furnace array with automatic balancing, water elevators, that's my daily bread.